If someone would have told me that I would grow to like the third book in Butler’s Patternist Series, I probably would have rose up in protest. Seriously, I returned to my previous review of the text and I cringed. Primarily, it was because I have more knowledge now about the storyline than I did then. After reading Survivor (1978), I developed a deeper appreciation for Clay’s Ark because Survivor discloses what happens when humans leave Earth, and Clay’s Ark exposes what happens to the people who remain on Earth, after they learn about the Clay Ark disease. Coupled together, the books are especially notable, just as important as the coupling of Butler's Wild Seed (1980) and Mind of My Mind (1977). In order to gain a deeper appreciation for and better understanding of Butler's texts, readers seek out the entire series of Butler's works (Admittedly, getting access to the out-of-print Survivor is a challenge). 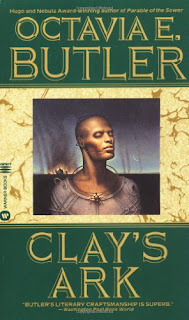 The benefit of reading a full series by Butler is that we gain awareness of underlying and interconnected themes and motifs across several of her works.